Bush, as Texas Land Commissioner, has been criticized by his predecessor for making “change for the sake of change” with his shake-up of the leadership in the General Land Office. Hear his response. Texas Land Commissioner George P. Bush has spearheaded a 'reboot' of the state's General Land Office. Just shy of his first year in office, Texas Land Commissioner George P. Bush has certainly made good on one important campaign promise – giving the General Land Office (GLO) a reboot. The oldest state agency has undergone major staff changes, a website overhaul, and negotiations over how the Alamo will be managed. But not all of the news has been upbeat: he’s gotten pushback from a former state official and he’s been criticized by some in the media for taking too much time away from work to campaign for his dad, presidential nominee and former Florida governor Jeb Bush. 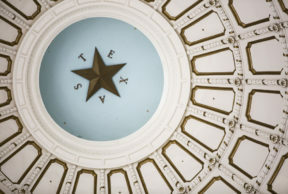 He calls the GLO “the most important state office that Texans don’t know about” and says the changeover in these positions has to do with following through on a campaign promise of fiscal conservatism, rather than reflecting his view of his predecessor. “I don’t have time, frankly, to deal with commentary, whether it’s from my predecessor or from my critics,” he says.